Photo-etch is particularly suitable for the finer items in a kit, things like grilles, name plates, windscreen wipers. We use photo-etch for many such parts in our own kits and offer this process to others. We produce digital drawings and films with Corel Draw. 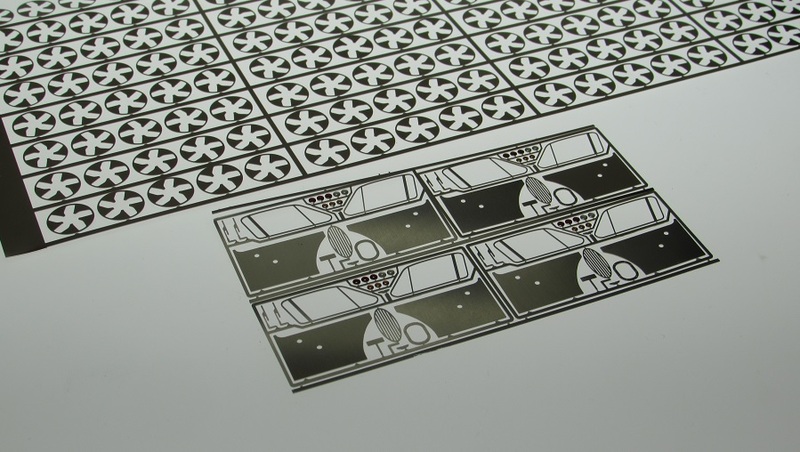 Mostly the photo-etch material is 0.2mm thick (Newsilver), but other thicknesses and types of metal can be used. We can electroplate for gold, etc. Cost for artwork is charged on the basis of time, and cost per piece is charged on the basis of size, thickness and the kind of material. Minimum order is 5 sheets.